Capital punishment in Malaysia applies to murder, drug trafficking, treason, and waging war against Yang di-Pertuan Agong (the King). Recently, the law has been extended to include acts of terrorism. Any terrorists, and anyone who aids terrorists, financially or otherwise, are liable to face the death penalty. Ours is by the rope! The infamous lime green gas chamber at San Quentin, where all of California's death sentences are carried out. 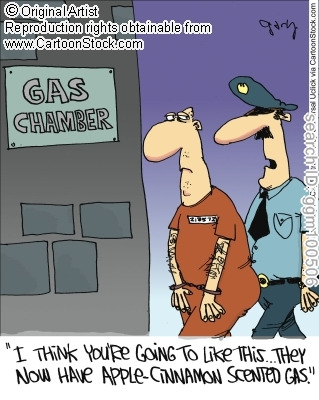 Today the room is used for lethal injections; California abolished execution by poison gas in 1995.